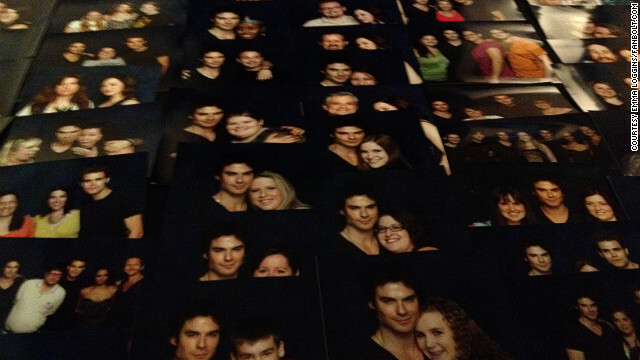 Proofs from "The Vampire Diaries" meet and greet at Dragon*Con 2012. Editor's note: Emma Loggins is the editor of Fanbolt.com, an fan news site that specializes in behind-the-scenes information and interviews with the casts and crews of entertainment franchises with organized fan bases. She can also be found on Twitter @EmmaLoggins. Dragon*Con's Walk of Fame gives fans a rare opportunity to meet their favorite sci-fi stars: This year celebrities including Gillian Anderson, Richard Dean Anderson, and Dean Cain held court as fans waited in line at the Hilton hotel in Atlanta to meet the stars they idolize. The event also gives celebrity guests an out of this world opportunity to make some serious dough, with merely the swipe of a pen. Out of nearly 400 celebrity guests that attended Dragon*Con this weekend, about 100 stars were available to meet their fans at the Walk of Fame. Some of the longest lines were for the cast members of "The Vampire Diaries," who charged between $30 and $45 dollars for autographs and $45 to $55 dollars for photos with fans. Fans could even get a photo with the all of the show's cast members in attendance for $240 dollars. At one point there were more than 40 fans in line for "Torchwood" star John Barrowman, who was charging $55 dollars for a signed picture, with a consistently long queue of fans waiting for him throughout the weekend. It's not hard to do the math. Is the experience worth a fan's hard-earned money? It was for Tom Gardiner, who had a great experience getting autographs from John Barrowman for his daughters Emily and Hannah. "It was definitely worth it," Gardiner said. "John took time to interact with each of his fans, and he didn't have to do that." "X-Files" fans were in heaven after having a chance to meet Gillian Anderson. The conspiracy-focused sci-fi series may have ended a decade ago, but it's still a fan favorite. Anderson's was one of the more expensive autographs this year: She charged $60 dollars for an autograph and an additional $20 dollars if a fan wanted a personalized note. I'm guessing at least one fan had her sign a headshot with, "I want to believe." Caroline McCormic had nothing but good things to say about her experience with the Walk of Fame, even though she admitted it can get rather pricey for fans. "It is very convenient to have all the stars in one place. If a celebrity doesn't have many people in line, you can often have a fun conversation with them. This is basically the only opportunity for any interaction," McCormic explained. "It is where I spent the majority of my time at Dragon*Con, and I would definitely recommend it – just bring plenty of cash!" Celebrities didn't want to discuss with me how much cash they make from these events, and it turns out Dragon*Con organizers can't be sure, either. However, Walk of Fame director and 11 year Dragon*Con vet, John Hancock, (yes, the director of the event where celebrities hand out autographs is actually named John Hancock) knows the celebrities sign an impressive number of autographs throughout the convention. "I wouldn't begin to know how many thousands of autographs they sign. Some of them literally sit there and sign for hours on end, while some don't have quite the huge line," Hancock said. "In all honesty, I wouldn't feel that I'm exaggerating to say there are probably a million signatures exchanging hands during Dragon*Con!" With the demand for autographs continuing to grow each year as the convention brings in more attendees and bigger celebrities, the prices for photos and autographs have grown as well. "When I started at Dragon*Con it seemed everyone was charging $20 dollars for an autograph. Over the years I've seen the prices get higher. I've seen some charge $65-$70 dollars, I've seen some that do combo deals for a picture and autograph for $200 dollars," Hancock explained. "At this point I'd say the average cost for an autograph is $45 dollars maybe. Most stick around the $30-$40 dollar range." Money aside, the experiences that fans have in these brief moments with their favorite stars are moments that they carry with them for a lifetime. Can you really put a price on that? Ildar Prime didn't think so. His favorite Walk of Fame story didn't even involve him, but he still enjoyed witnessing the awkward moment one fan had with actress Felicia Day. "My favorite story is when this guy met Felicia Day and just froze, couldn't say a word for few minutes. She eventually saw he was wearing a World of Warcraft shirt, and being a fan complimented his shirt. All he could say in response was '...I like yours too.' Felicia, wearing a plain green shirt, awkwardly laughed and said 'and it's now creepy.' " Prime recalled. "It was hilarious and everyone just laughed it off." Being a fan isn't cheap. Collecting autographs, photos, and other memorabilia can quickly deplete a checking account at conventions like this. However, at the end of Dragon*Con, fans seem to be thinking about next year and doing it all over again. These experiences are priceless to them. Have you visited Dragon*Con's Walk of Fame? Stood in long lines for autographs and photos at other conventions? Share your stories with us! Provided that all expenses have been covered for the guest, I disagree with charging money just for an autograph. It seems redundant to me to pay an entrance fee and then have to pay another fee for every guest you want to meet and get an autograph from. I've gone to several anime conventions on the West Coast and I've bought a lot of sketches from artists. I don't mind paying for an original sketch – someone is putting some time into drawing something for you. But for a guest to spend 20 seconds signing something and then charging $50 (after already having paid to attend the convention) is overkill. Let's hope that this convention trend doesn't catch on over here; I'd hate for Anime Expo to turn into an a la carte experience like Dragon*Con. Many, many years ago I was active in science fiction fandom. Back then, the stars would cheerfully sign for free, so would the writers. I used to have autographs from Gene Roddenberry, DC Fontana, David Gerrold, a few of the Star Trek actors, Louise Jamieson from Dr. Who and a wide range of authors and comic book creators. The idea of charging for an autograph seems almost self-defeating, an admission that you're not there to interact with your fans but just make a fast buck or two off of them. You have to remember that some "fans" are just there to get an autograph on some piece of memorabilia that they're going to turn around and sell on ebay. Many sports figures do the same. The autographs that meant the most to me were always the ones that cost the least; because they came from people, just doing something for you to be nice - from Anne Francis, who would sign just about anything for you, but later had to start charging a whole 5 dollars, "just to cover the mailing", and apologized for having to do that. Or Kiki Stockhammer, Newtek's original spokesbabe (yeah, old school Amiga geek here), who sent a signed photo because Newtek used to have a line on their Video Toaster warranty cards that asked "What would you like to see next from Newtek? ", and I tought it would be funny to write "An autographed picture of Kiki Stockhammer". When it showed up a couple of weeks later, I thought that was the coolest thing ever. Wherever you are, Kiki, still love you! OMG.I am now wondering if Pete Abrams was an Amiga geek back in the day, and if that's where "Kiki" came from? I mean sluggy.com, of course. It's the longest-running comic on the web. Google her, she's still big. Comic-Con 2012 Camped out for Firefly panel and got Joss Whedon's autograph on two items for free. Also, $20 (which he was donating to Operation Smile) for a photo with Zac Levi. I don't really understand the paying for photos/autographs when the actors take the money for themself. Seems awkward. You must have googled the kilts. That's pretty isterenting. It's hard to read an account like that because you find yourself agreeing with the writer concerning rules and management, but then you realize that those rules and the way they are enforced are what sets Disney parks apart from others.It would be tough. They're taking time out. They are not being paid except in free room and food in a specific con suite unless they decide to go out and eat. Which is usual. Which means they're losing money by going to Con. They do have fun meeting fans or else they wouldn't go to it. But the fact remains, that a little cash goes a long way toward easing the weekend. Now, I do view spending over 75 on one actor as too much.. so I did not go. On the other hand, I know someone from England who viewed it as a great expense and was happy with it. So let's think of the low end good quality restaurants. The ones worth eating at are at minimum 12 dollars a meal not counting drinks. The actors don't go to these since they're out on the main strip, and the fans outnumber them. Instead they go to restaurants that close off whole sections. Which, cost more than 20 per usually. View it this way. You're paying them a compliment by paying for their meals so they can have a little more enjoyment out of the convention. My family has been going to Dragon*Con for years. It's true that in years past, autographs were usually $20, with some stars charging additionally for the 8×10 glossy that they signed, and some not. This year, we shelled out $75 for our kids to have their picture made with John Barrowman, because they love his character in Doctor Who (well, we all do). It was a professionally shot portrait, and it guaranteed that they would get to meet him. It was worth it to be able to give them that experience. When we went by Mr. Barrowman's table in the Walk of Fame later, just for the kids to say hi one more time before he left, he signed a photo for them gratis. Not all actors are that kind or classy, but in all of our years there, I've never seen someone be a jerk to a kid. With Dragon*Con, you just have to know what you're getting into. Buy passes as early as you can to save money on that front. Last year, we pre-purchased passes for this year at a rate of $60 a piece. That's $240 for a family of 4 for a 4-day convention. That's a huge savings over the later rate of $120 per pass ($480 for the family). There are ways to strategize to save money on food and lodging, so that you have money for things like autographs. And very often, you will see stars in the lobby, the hotel restaurant/bar, on the elevator, on one of the skybridges, or even entering the hotel room next to yours. If you are polite and respectful of their personal space, you are more likely to have a good encounter with them during that "off" time. I've met quite a few writers and creative people as the years go by, and I have professional organizations in common with a few of them. It's hilarious to go to DragonCon and see them being mobbed. Tom Shippey was there one year trying to explain word origins to a bunch of LOTR movie fans, who had never before heard the word "etymology." But this kind of convention is work, not vacation, and it's expensive to live when you are a public figure. Nerds that have piles of money because they don't have girlfriends are able to dump piles of cash of bad actors with fake ray guns. Dragon-Con might as well be renamed Virginstock. "Dragon-Con might as well be renamed Virginstock." Wow, you must have a rich fantasy life yourself if you think people aren't getting laid right and left there. Pro Tip: google "DragonCon Kilt blowing" for details, especially if you liked Magic Mike. Interesting considering that all of my male friends that go to cons go at the behest of their girlfriends. How clueless are you? Looser than what, kid? Just keep hating everything and you'll get out of high school one day. Yes, these are just first world problems! And what are you doing here, pointing this out when people are dying around the globe from war and starvation and exploitation by greedy corporations! Are you posting this from your smartphone as you lead Syrian refugees to safety? Or are you still at your desk? Go, go! For the good of humanity! I've never paid for an autograph, and never will. The only time I ever stood in line for an autograph was for Stephen King, and I doubt I'd do it again. Autographs just don't mean a lot to me personally. I do appreciate that these days however charging for autographs might be necessary to keep the autograph lines to something reasonable never mind the money made. Does the con get a percentage? If not they should for providing the venue. It seems like it would be adding insult to injury to charge the con for gracing it with their presence and then raking in autograph dollars on top of that. The hotels charge, so the con charges; you rent a table there to sell your stuff. Not only the stars but toy collectors and webcomic artists and publishers get tables and booths. The celebrity guests do not pay for a table. They are paid for their expenses, plus an appearance fee. The autograph charge is extra. They don't need to charge for the autograph as they've already been paid and compensated for their expenses. Some stars are more down to earth than others, and are fine with you just saying hi etc. The thing that bugs me is that to get in to the room where certain stars are, you have to pay an additional fee just to get in! This was the case with the Vampire Diaries stars, and I believe Gillian Anderson may have been there as well. It was an additional $40-45 (nearly the cost of a one day ticket to the con!) just to get in, plus any fees for pictures and autographs. I'm a widowed mom with two kids who are scifi fans. I cannot afford the signatures, the best we can do is say hello quickly and move on. My favorite experience at the Walk of Fame was meeting Gil Gerard of Buck Rogers fame. I cannot remember how many times I saw the film. Gil was gratious and hilarious. Not too many people came to his booth so I was able to visit him a few times and had a blast. He even remembered my name each time I came over. Thanks Gil!! I went to DragonCon with some friends this year, my wife found out that Joe Manganiello from True Blood was going to be there. So with my her being a big Magic Mike fan, I had to stand in line for around 30 min with a bunch of ladies. It was pretty awkward. Next year, wear a kilt. Dragon*Con and all the Star Trek conventions are giant ripoffs. Sorry, I love your acting Patrick Stewart, but the fact that you were essentially making $18,000 an hour to stand still for a picture is insane. If, by Star Trek conventions you mean the for profit Creation ones... then, yeah. The charges for those are through the roof. They are a case of paying for a membership for a dealer room, and paying through the nose for everything else. However, there are fan run conventions that started out as Star Trek conventions and drifted into all media that are quite good. There are two in MD every year that I have been involved with, that cap the cost of an autograph, and are small enough that the guests actually hang out in the bar. At one in particular 2 years ago, Edward James Olmos held down the largest table in the bar all Sunday, wrapped in a Spanish flag, while Spain played the World Cup. Dragon*Con... is getting very large. Yet, you can still bump into somebody famous just walking around (Hell, I did, Sunday, walking through one of the sky bridges. If you want an autograph or a picture, you usually pay. If you just want to say hi, you can wait in line, say hi, and walk off. No problem. I met with several folks in the Walk of Fame this year and didn't shell out money. Just as someone said you can talk to most of them free of charge. Of all the ones I did meet though? Collin Fergusson was absolutely amazing and genuine. It is experiences like I had with him that will last me a lifetime of memories and that didn't cost me a penny. You write either "$100" or "100 dollars," not both. "$100 dollars" would be pronounced "100 dollars dollars" which is silly. APA would be $100. Keep it simple.